With BDSHoles giving Hollywood actress Scarlett Johansson hell over her association with SodaStream because they operate in the so-called “West Bank,” it bears remembering that this argument is disingenuous. You see, the BDSHoles’ aim is to boycott any Israeli company or institution, and not just those in the disputed territories. But don’t take my word for it. Here is Scottish BDSHole Mick Napier revealing the truth to an Arab TV station, likely unaware someone like me would get hold of it. But he goes further than that. At 24:15 onwards, he rubbishes the two-state solution and speaks of historic Palestine. In other words, he wants the eradication of the entire state of Israel. None of this is new. But it bears reminding. Bonus: Enable captions on the video for a good laugh. Trust me. 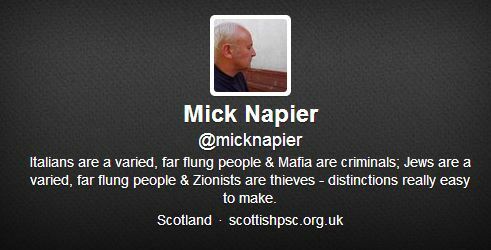 Update: Mick Napier’s Twitter account is also revealing. On his Twitter profile, he clearly tries to distance himself from any possible accusations of antisemitism.